Sydney Craft Beer Week is over for another year, and BotF’s attendance was quite frankly pathetic as cricket matches and work et al conspired against any real boots’n’all attendance. This correspondent’s only real experience of what looked like a wonderful week was an all too brief visit to Hart’s Pub, where Doctor’s Orders Brewing had taken over a number of taps. 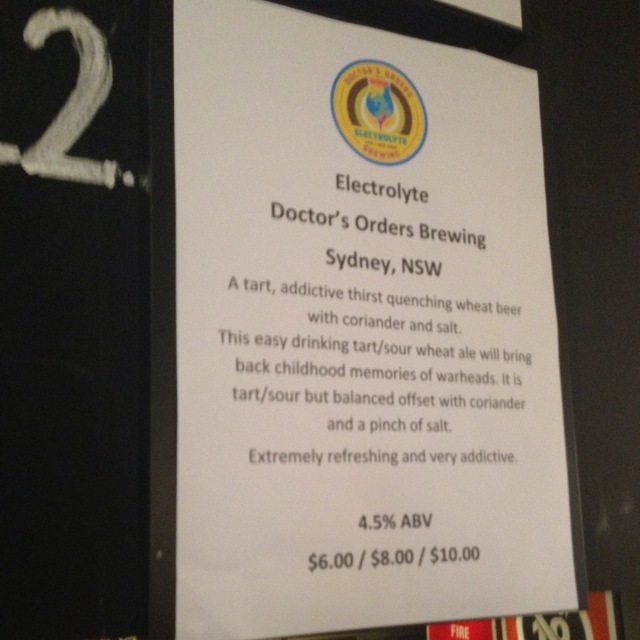 Well, if this was to be my only Sydney Craft Beer Week experience, at least I’d be able to do two of my favourite things – drink the Doc’s beers and drink at Harts Pub. I brought a trio of work mates with me, none of whom are shy when it comes to trying something new. 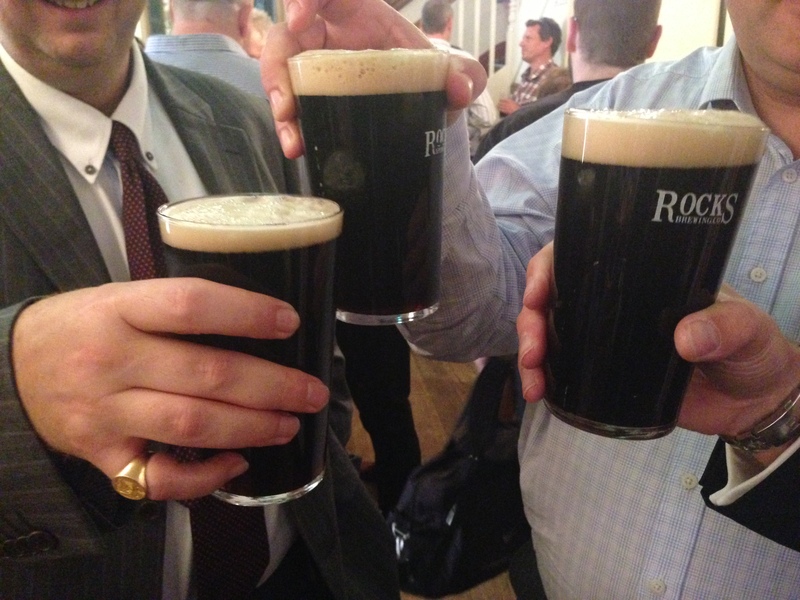 That was a good thing – because all of Doc’s beers challenge the palate, and with such a wide range on offer – some palate challenging occurred. I had the good fortune to bump into Doc during our all too brief session, and he’s definitely developed a loyal following. At 5.30pm, when we popped in, there was quite a crowd. Apparently there were people waiting at 12 to get in. That meant that I missed out on a couple that I hadn’t tried including the wonderfully named “Morning After Pill”. No matter, there were still at seven of the Doc’s prescriptions to try including two off the hand pump. First up was Electrolyte, which is Doc’s take on the Gose style of beer. Predominantly a wheat beer, this also has salt and coriander in it. For me it started off like a hefe, but had a very tart crisp finish. Want to drink this in the sunshine. With not much time available, I vaulted straight from the Electrolyte to Intravenous. Intravenous is a “Barrel Aged Belgian Black IPA” (try saying that after a pint) and quite simply it is a sensation. The Doc reckons it’s “boozy”, but whilst it is big in many ways the 7.7% ABV is handled really well. It has plenty going on, but I really love its jet blackness and back bone of bitterness. An outstanding beer. 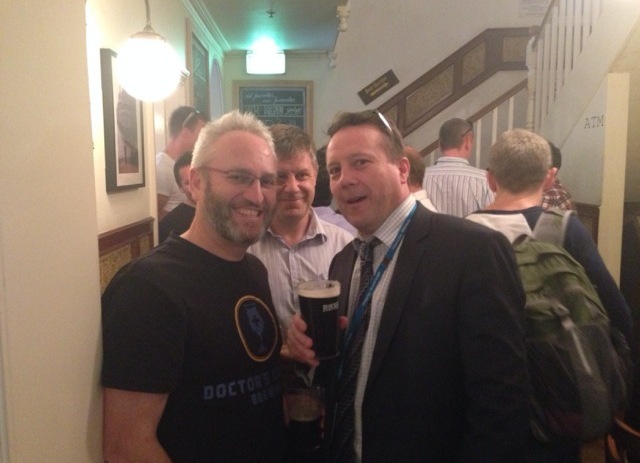 It’s always a please to drink with the Doc. There is one of Doc’s creations I didn’t fall in love with at that is the green version of Cephalopod. Watchin my most adventurous mate try a tulip of this was almost the highlight of the day. It starts off ok, but it didn’t end well. I recorded the facial expressions, but have decided to protect my mate’s grimacing from public consumption. 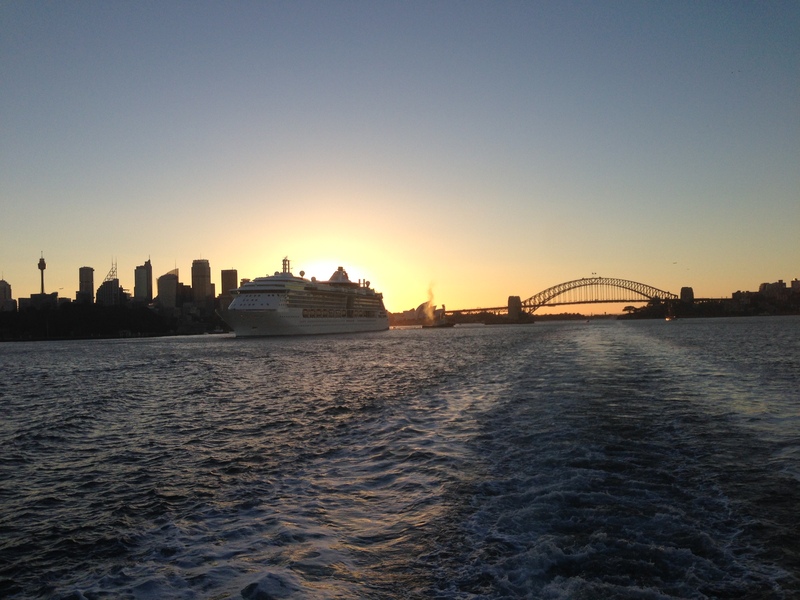 After the quick scamper down the hill to Circular Quay, we had a treat on the voyage home. 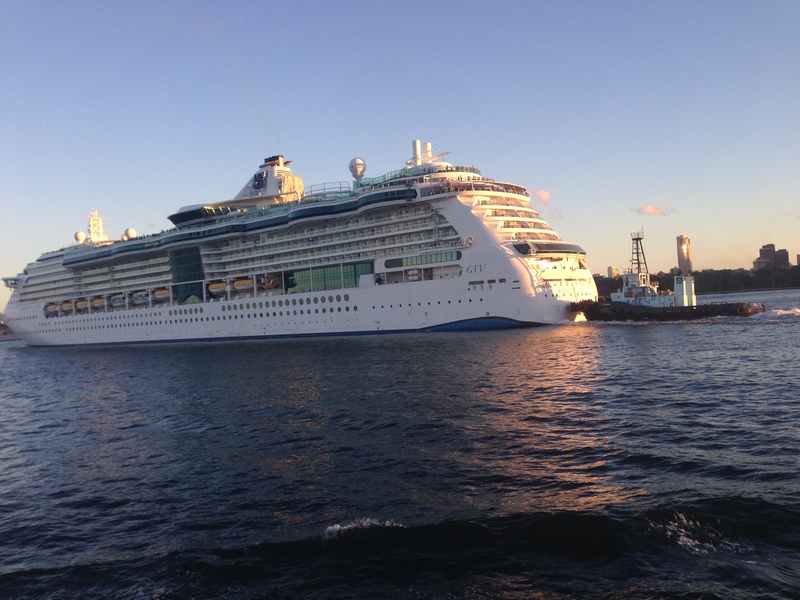 We were able to witness the departure of the Radiance of the Seas and all that that entails. Tugs are great things and I love seeing these little boats push 90,000 tonnes of boat on its way. The Radiance of the Seas is ridiculously opulent with 4 lifts operating in glass cylinders on the side of the boat. The Radiance is apparently one of the first cruise boats to have pool tables that have gyroscopically operated surfaces that provide a constantly horizontal surface. Like I said – ridiculous. Cruise season has started.